November 23, 2015. 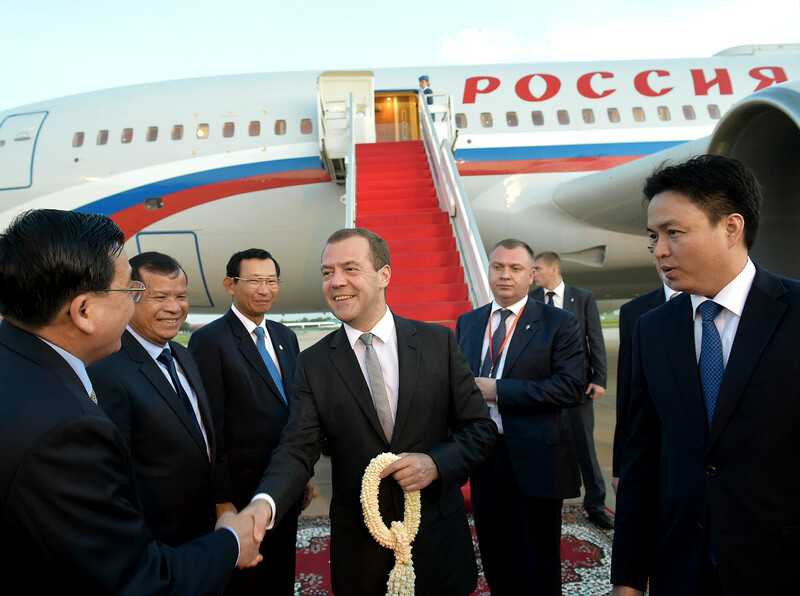 Russian Prime Minister Dmitry Medvedev, center, is welcomed at Phnom Penh International Airport during his working visit to the Kingdom of Cambodia. Despite the fact that ASEAN countries now occupy a key place in the updated Russian Foreign Policy Concept, Moscow’s economic ties with Phnom Penh remain stagnant. Experts attribute this to the unresolved debt issue. Cambodia has repeatedly asked Russia to forgive its Soviet-era debt of $1.5 billion. It is not quite clear why Russia refrains from writing off the $1.5 billion in debt that it is owed by Cambodia, an informed source familiar with Moscow’s ASEAN policy-making told RBTH. Russia is not the only country that is unwilling to cancel Cambodia’s debt, according to Nadezhda Bektimirova, who holds a doctorate in historical sciences from Moscow State University. “The U.S. refused to write off a much smaller sum of $300 million,” she says, agreeing that that the debt is a tool for getting future preferences for Russian businesses. “This was confirmed during a meeting of Cambodian Prime Minister Hun Sen and Russian President Vladimir Putin in Sochi, when the former offered to cover part of the debt with the supply of Cambodian products and convert another part into a mechanism that provides preferential treatment for Russian companies in Cambodia,” Bektimirova adds. Since the establishment of Soviet-Cambodian relations in 1950s, the USSR and the Southeast Asian country maintained strong contacts in the areas of education, science, culture and health. The peak of this cooperation was in the 1980s, when the Soviet Union gave Cambodia full-scale economic and military assistance. Some hoped for a breakthrough in bilateral relations when Russian Prime Minister Dmitry Medvedev visited Cambodia in 2015. During the visit the parties signed several documents, including an air services agreement. However, there has been little follow up on these agreements since the visit, which took place a year and a half ago. RBTH’s source says the situation should not be dramatized, as "in 2016 there were a lot more important issues than Cambodia,” referring to the elections in the United States and the situation in Ukraine and Syria. Bektemirova notes that there were some developments in 2016. “Moscow hosted both Cambodia’s Foreign Minister (in October) and Defense Minister (in April), who signed several agreements. Cambodia has several pieces of military hardware that date back to the Soviet era. Russia agreed to supply spare parts and repair old equipment,” she says. In 2016, Russia's policy in Southeast Asia began to take visible shape, and Moscow made it clear that it wanted to establish relations primarily with those countries with which it enjoyed long-term friendly relations, the source told RBTH. According to experts, the main potential when it comes to economic cooperation is in energy. "This includes equipment for diesel and hydroelectric power plants, supply of agricultural machinery, which Cambodia is in need of,” Bektimirova says.